Click here to share the message on Twitter! 1. We Rocked Against the TPP! 3. Time to get in the street to shout out loud! 6. Take Action Against the TPP Now! We Rocked Against the TPP! As the White House readies a last minute desperate push to pass the Trans-Pacific Partnership, large crowds descended on Portland for the Rock Against the TPP Oregon weekend of action. Oregonians took action, educated themselves, had fun and enjoyed a great concert! This was part of a nationwide protest tour featuring celebrities such as Golden Globe nominated actress Evangeline Lilly, comedian Hari Kondabolu, and punk rock legends Anti-Flag. The tour next stops in San Francisco on September 9th at Regency Ballroom with an event featuring Jello Biafra, Grammy winning latin alternative band La Santa Cecilia, and riot-grrrl cello legend Bonfire Madigan. Additional tour dates to be announced, for more information visit www.RockAgainsttheTPP.org. A huge thanks to all of the over 55 local and regional endorsers! Full list here Many thanks to some of the organizations who went above and beyond to make this weekend of action a success: UFCW Local 555 for all of your support in printing the massive amounts of materials for promotion and the events. Portland Jobs with Justice for organizing the March Against the TPP. Sierra Club for speaking, providing staff support, and phone banks. Teamsters for artist transportation. Greenpeace and 350PDX for organizing art makes and creating awesome props. Machinists, Portland Committee for Human Rights in the Philippines, and ILWU for recruiting volunteers. Cascade AIDS Project, Burgerville Workers Union, Fair World Project, Pride@Work, OPAL Environmental Justice Oregon, Machinists, GABRIELA Pdx, and Black Lives Matter Portland for speaking. Thank you! On Tuesday August 23rd there was a new addition to the Capitol skyline in Salem. As USW, UFCW, ORFTC, and others gathered on the steps of the capitol, a 25 foot blimp flew in the sky reminding Gov. Kate Brown, Rep. Kurt Schrader, and Sen. Ron Wyden that the TPP is bad for democracy, bad for US jobs, bad for our planet, and bad for Oregon. Speakers at the rally reminded the Governor, who recently came out in favor of the TPP, of the loss to Oregon manufacturing since the passage of NAFTA, the lack of worker protections in the TPP, and the dim economic projections in the recent International Trade Commission Report on the pact. More information here. After the rally participants went to Rep Kurt Schrader’s Salem office to deliver messages from hundreds of constituents asking him to oppose the TPP. The following week Portland and Beaverton fair trade advocates came out in force to send a very loud message to both Rep. Earl Blumenauer and Rep. Suzanne Bonamici that they are out of step with their party, their districts, and their state when it comes to their indecision on the TPP. In addition to delivering hundred of Bad Trade Kills Good Jobs and Rock Against the TPP postcards, constituents spoke with congressional staff expressing why they are asking their Representatives to come out against the Trans-Pacific Partnership. Thank you to the members of CWA Local 7901, Alliance for Democracy Portland, Beaverton Social Justice League, USW, Oregon AfterBern, Portland Jobs with Justice, 350PDX, and so many more who showed up to stop the TPP! Time to get in the street to shout out loud! Alliance for Democracy taking it to the streets! For over a year the Alliance for Democracy has been doing just that with our twice weekly street corner sign holding. Designed to get the attention of drivers at one of the busiest intersections in Portland (E. Burnside and SE Martin Luther King Jr Blvd), we have flyers to hand out explaining the dangers of TPP to democracy, the environment, and labor. YOU ARE WELCOME TO JOIN US! Either just show up or to get on the Alliance e-mail list email me at davidafd@ymail.com. Want to just show up? Great! Join us on Tuesdays beginning at 2:30pm or Friday at 4pm. Check the Alliance for Democracy TPP Action webpage to confirm times. It is time to expand these actions, so if the above times do not work for you contact me at davidafd@ymail.com to see if something else can be arranged. Bravo, ORFTC and Rock Against the TPP friends! Now more public events, and what else? Some of you are already phoning lawmakers weekly or more often reminding them Oregonians oppose the TPP. You tell them that the TPP would enable corporations to disable our government’s sovereign power to protect our environment, our working people, and our planet; would cost good jobs and suppress wages; and would increase climate change and other environmental damage. I want to help. Every week I organize a series of phone actions. You’ll get copies of the letters and documentation I send to our lawmakers, reports about specific devastating effects of the TPP, and one-minute phone message samples (with phone numbers). Please tell me if you want to join me and let’s keep working together! E-mail me at frankelh@comcast.net for more information and to get added to the weekly updates. 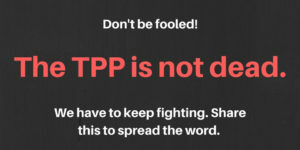 Take Action Against the TPP Now! Have you written an e-mail to your Congressperson telling them to oppose the TPP today? You can do so right here!